IT departments are nowadays having to do more with less, gaining additional productivity while spending less money. It sounds simple, but making it happen is very complex. How do IT departments and companies approach this problem? How will cloud computing and "fluid sourcing" options help or hinder the process? And how can IT budgets slide while expectations rise that new architectural approaches can be adopted with low risk? To probe deeper into the harsh new IT economies of performance can be managed, BriefingsDirect sat down with Anton Knolmar, Vice President of Marketing for HP Software & Solutions, for a discussion moderated by me, Dana Gardner. 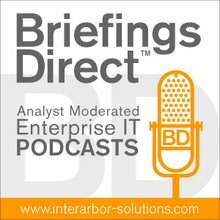 It comes as part of a special BriefingsDirect podcast series from the Hewlett-Packard Software Universe 2009 Conference in Las Vegas this week. We've just come out of an executive track. We had about 70 people gathered for the discussion. What is at the top of their minds is all about linking IT with the business. This is a story that we've been telling now for more than 10 or 15 years, and the storyline is not over. They’re still trying to bridge the gap and talk business language, instead of IT language. One the other hand, they're trying as well to look at the emerging trends. What the heck does this cloud means for them? How can you do cloud computing here? Does this bring added value to them? What’s the business outcome they can drive out of those activities? Our offerings around the cloud at the moment are governance tools along with the cloud. You can really manage the cloud. You can really secure the cloud. And, you can get the right performance out of the cloud. That’s our offering at the moment to our customers. They can take the first step, get this one right, and move into the cloud environment. We are ready to drive those three angles. How we can help customers drive revenue growth? How we can help them mitigate the risk? And, on the other side, how can we help them get their costs under control? These are the three angles will be on the table for quite some time. The developer community, as you said, has different concerns in terms of developing the applications and developing things for the cloud as well. Our approach at this time is that we enable them to have the appropriate developing and testing tools in terms of quality, performance, and security. These are essentially for those people who have to develop applications well for the cloud. Those are blocked in immediately, are ready to go out there, and can be managed across the lifecycle. Getting the right information at the right place and making the appropriate decisions are still on top of the agenda for lot of our customers at the moment. It’s been the number one issue for quite some time, and I think it will be the number one issue for quite some time. We have an offering in these four lines of business in HP Software and Solutions. One is, you gather around the Business Intelligence piece. What we are investigating at the moment is really about how can we bring those offerings as more of a direct offering to our customers in terms of purchasing and licensing? How can you bring those offering into kind of a cloud offering? But, that still needs some further negotiations inside the company, as well, about development products. But that’s definitely an interesting angle.